In perhaps my lamest Valentine’s Day post ever, I give you Alton Brown’s recipe for Steel Cut Oats (with minor modifications). He says it serves 4 at 142 calories each, but I’d say it serves 2, so that would mean this is about 300 calories (before toppings). This took a good 45 minutes to make, but it’s worth it on a weekend. And my Valentine said it was the best oatmeal he’s ever had, so that’s a pretty good endorsement. brown sugar, cinnamon, berries, greek yogurt, peanut butter, jelly, etc. In a large pot, melt the butter and add the oats. Stir for 2 minutes to toast. Add the boiling water and reduce heat to a simmer. Keep at a low simmer for 25 minutes, without stirring. 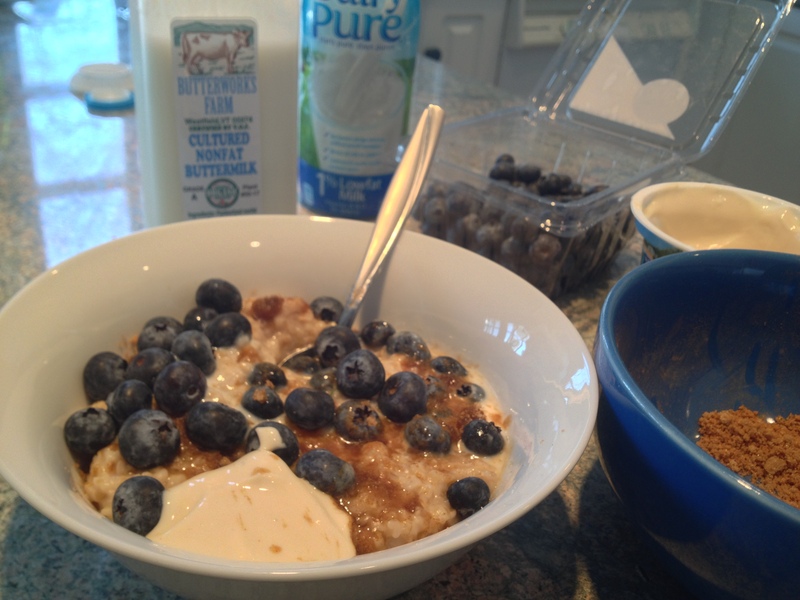 Combine the milk and the buttermilk with the oatmeal . Stir gently to combine and cook for an additional 10 minutes, or until it reaches a consistency you like. Spoon into a serving bowl and top as you like. This would be even better if it included a side(s) of bacon! Larry – The Blueberries are from Whole Foods in Arlington. The fresh fruit there is always great, but apparently Kate was taught by real experts in how to pick the best Blueberries (Larry) and Men (Pat)!